In Destination Home, Ragged Wing Ensemble explores the slippery concept of home, often in surprising, dreamlike ways with four short plays. Lisa Drostova as She 3 in Rock Springs. Home is a slippery concept — at times both meaningless and overwhelmed with meaning. It can be rooted in geography, memory, people we have known, rituals, and even in physical objects. With Destination Home, Ragged Wing Ensemble attempts to capture and free the haunting ambiguity of "home," by answering the question: "If home were the destination, what would the journey look like?" Writer-director Anthony Clarvoe takes most of his dialogue for his short play, Rock Springs, from his 88-year-old mother, who was born in the coal town of Rock Springs, Wyoming. 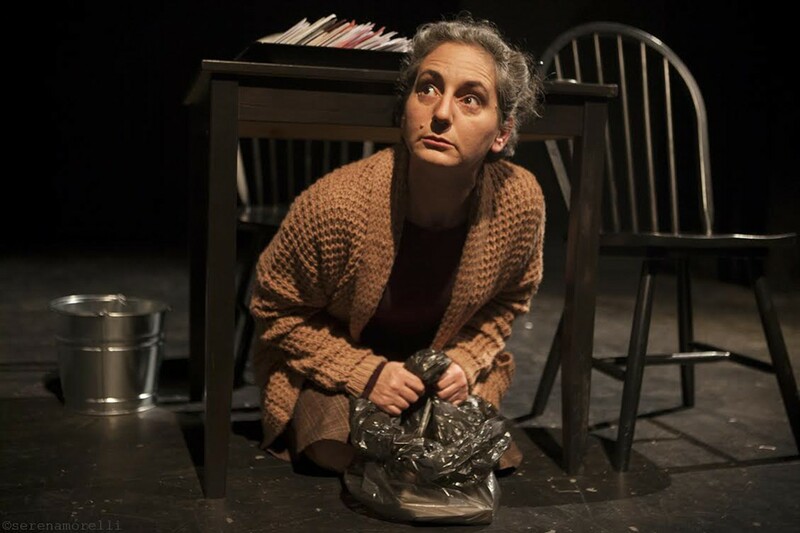 In a kind of personified fragmentation, the mother is played concurrently by three people, called She 1, She 2, and She 3 (Anya Kazimierski, Mary Matabor, and Lisa Drostova, respectively). As the Shes gain and lose their memories and senses of place, an improbable quest for recollection occurs. In Fantasy Home Sweepstakes: Malibu, writer-director Windy Wynazz, and writers Michele Owen and Sabrina Wenske base their humorous, largely dialogue-free play on a response from an interviewee who was walking past the Flight Deck (the multi-disciplinary art space in which the play is housed), who felt that "home" meant making enough money to buy a house in Malibu. In Mother's Fever Dream, a solo work written and performed by Cecilia Palmtag, a child tries to make sense of death and the world around her using toys and her imagination. And in Making It, Addie Ulrey explores the concept of "making it" as an artist, framed by two Midwesterners (Travis Coleman and Puja Tolton) traveling to California during the Gold Rush. 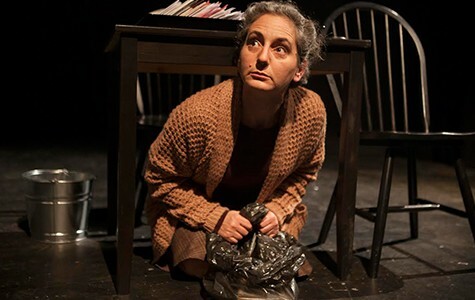 Ragged Wing Ensemble often takes a collagist approach to storytelling, and because of that, all of the mini plays in Destination Home are predictably weird, experimental, and tend to veer wildly from conventional notions of plot and dialogue. In other words, don't come expecting neat story arcs and tidy resolutions. Indeed, it's far more enjoyable to experience something like Destination Home by relaxing into the discomfort that comes with not ever being completely sure what is going on. In the same way that "home" can be both a troubling and necessary conceit, our conceptions of what a "play" is can also sometimes be limited and problematized by our expectations. Which is why it is so delightful, for instance, to watch two clowns lose their dream home to a floating mannequin head, as was the case in Fantasy Home Sweepstakes: Malibu. The Beckett-esque characters in the play, Christina Shonkwiler and Michele Owen, don't speak at all throughout the story, instead relying on their physical expressions and clowning to create a fantastical cartoon world that is both hilarious and somehow fraught with tension. Bringing it all home (pun unintended) is Sango Tajima, the sweepstakes host and bumblebee (?) who spends the majority of her time being wheeled around on stage and manically flapping two tiny American flags — to great comic effect. Taken collectively, Destination Home functions as a hall of mirrors — audiences will recognize the familiar grappling and trappings of home explored in the four short works at the same time that they will also probably be baffled by them. Home is, after all, a place that often doesn't exist, but a lingering image of someone or something you used to know. It is both a curse and a comfort, and Ragged Wing does an interesting job of mining the emotions associated with the bedraggled spectacle, often in surprising, dreamlike ways. Correction: The original version of this piece incorrectly identified the actors in Fantasy Home Sweepstakes: Malibu. Their names are Michele Owen, Christina Shonkwiler, and Sango Tajima. The reach of Berkeley Rep’s ambitious musical might at times exceed its grasp. But perhaps that’s its lasting message. You can't spell invisibility without bi. As the Lexington Club is set to close this month, a group of storytellers, artists, and filmmakers are trying to preserve its memory with the Lexington Club Archival Project.